Are gold and silver close to bottoming? 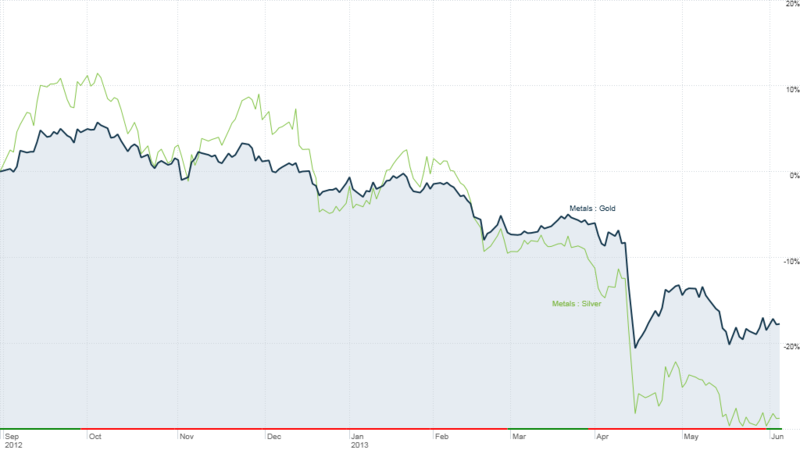 Gold prices and silver prices have been plunging. Click the chart for more on precious metals and other commodities. Precious metals have been in a tailspin for the past several months. Gold is down over 20% to around $1,400 an ounce from its September highs. Silver is down about 35% from highs in October to about $22. But the floor may be in. New supply is low because extracting gold and silver isn't as profitable as it was just a few months ago. But demand in markets like India and China remains high. So that may indicate the worst is over for precious metals. Randy Smallwood, CEO of Silver Wheaton (SLW), said the rough cost of extracting gold from the ground and bringing it to market is around $1,200 an ounce; for silver, the cost of production is around $20 an ounce. That makes him think there is a floor for prices at these levels. Other mining insiders echo these targets, and are reluctant to bother digging in earnest while low prices last. AngloGold Ashanti (AU) CEO Mark Cutifani, for instance, said in a recent interview with MineWeb that if gold fell under $1,200 an ounce, his company "won't bring new gold into production." 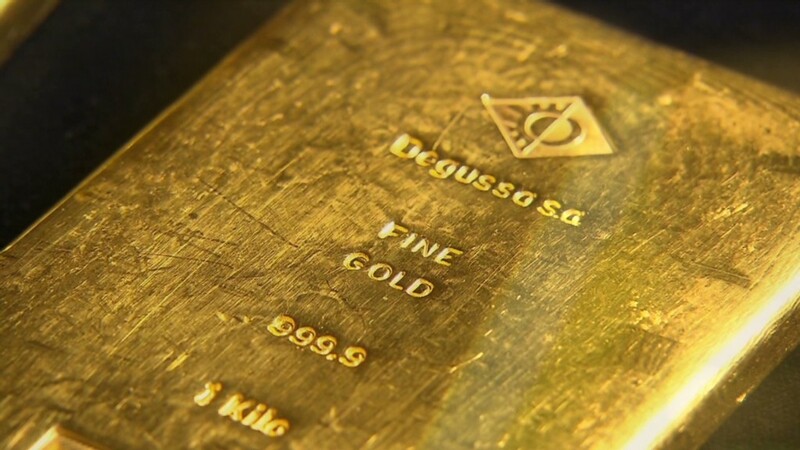 On the demand side, falling prices has kindled interest among buyers, particularly in Asia where the region's demand for bullion is setting a new record this quarter. In India alone, gold imports are expected to triple. Sounds like a good case for gold and silver to rebound right? Of course, that's only part of the story. Investors selling silver and gold right now are flooding the market with supply. Consider that the flagship ETF investing in gold bullion, the SPDR Gold Trust (GLD), has been forced to sell over 11 million ounces of gold in 2013 as folks have cashed out and moved on to other investments. Other gold and silver funds have been under pressure, too. Furthermore, lower prices don't guarantee miners will stop producing precious metals. According to commodities expert John Tumazos of Very Independent Research LLC , major gold miners like Goldcorp (GG) and Barrick (ABX) may look to cut costs by at least $100 per ounce in the second half of the year to offset the lower price of gold. He estimates that the cost to extract gold was under $1,000 an ounce just 12 months ago ... so if miners are cutting costs to $900, they can still earn big profits even if gold remains around $1,400 ... or falls a bit further. Related: Has the gold bull finally run out of steam? As for silver, the precious metal is often the fortuitous byproduct of mining for other elements like zinc or copper. This means even if direct silver miners stop production altogether, some silver will still be coming to market by miners digging it up by accident. The other big problem for silver and gold? With U.S. stock market indexes up 16% so far in 2013, there are plenty of other investments out there that look good right now. Sure, there are always a host of moving parts when it comes to precious metal prices, including the effects of inflation or the need among investors to find a "safe haven" asset. The good news for metal investors is that there are plenty of signs pointing to some stability in gold prices right now... at least in the short term. But it may be unreasonable to expect another big rally for precious metals anytime soon. Jeff Reeves is a former New York Times Co. editor and is the current editor of InvestorPlace.com. Write him at editor@investorplace.com and follow him on Twitter @JeffReevesIP.